Another week, another game. Chad and I left Friday from Moon, PA in the pouring rain. It finally cleared up when we got to Suz’s house. We dropped off a cooler and parked in a super muddy RV lot: Row 6. The lot was filled again from back to front so the front end was pretty sparse. We took the loop downtown to get some sandwiches at RU Hungry. We walked downtown for a bit and then caught the loop back home. A driving rain and heavy wind buffeted the camper overnight. A dusting of snow covered the still squishy ground. Suz called at 7:30 to say that they were in the lot, but the wind was too strong and they were headed home to tailgate until game time. Chad and I cooked breakfast and relaxed in the camper until game time. Post game, we drove to suz’s house after the game to enjoy some home cooking. Suz accidentally dumped chili on my feet upon entering the basement. Eric brought his dog. We played pigs before the power in the entire neighborhood went out for several hours due to downed tree limbs. We lit up the basement with LED bulbs. Colleen and Mora were in to join us this weekend. Maddy had to go home early to take care of mom. We talked about favorites from past years. Chad drove back to RV lot around 11. A lot attendant made him park his truck outside until the AM. For our 2018 road trip, we left Thursday from Chad's house at 8:15 PM and drove west around Columbus to avoid rush hour traffic in the AM. We stayed the night at Love's truck stop in Springfield, Ohio because it was closer to the interstate than any of the nearby Walmarts (which may or may not have allowed RV parking). No one bothered us overnight. In the morning, we headed west on I-70 before stopping for breakfast at a Waffle House. After entering Indiana, we stopped in Indianapolis at the Dallara Indy Car Factory and only got a museum tour. No garage tours were available due to a special event. It was a short walk over to the the Indianapolis Motor Speedway, where we took an Indy 500 bus tour around the track and got to kiss the bricks. For lunch, we had sandwiches in the RV while rain started. From there, we headed to Bloomington. We parked in the aux RV lot and met some of the neighbors and the lot attendant. There were maybe about 30 RVs total. We went downtown to buffa-louies for dinner of wings and fries and walked around downtown before ending up at “the cade”, a bar with old school arcade games. There were rental scooters everywhere. Back at the lot, we had drinks with the neighbors while waiting for Cari and Eric. It was a late start as we woke up to a nice sunny, but breezy day. Chalupa enjoyed laying in the sunshine. I made breakfast biscuits and we sat out outside. We had burgers before heading into the game. I almost didn’t make it past the metal detector because of my steel toed boots. Finally, a cute stadium attendant showed the metal detector guy what to look for. It was rough game. By the end, we were all super cold. An on-side kick attempt kept Indiana in the game until the end, even though their fans cleared out by the middle of the 4th quarter. We walked back to the RV to warm up. from The Upstairs Pub . We rescued the Greene’s rental vehicle from the parking lot at McNutt dorm and then when back to the RV. We made breakfast and listened to the music from the baseball practice and packed up to leave by noon. Eric and Cari headed back to Indianapolis. Overall, this was a great trip. The Hoosiers were extremely friendly and welcoming. I'd definitely go again and would recommend the trip to everyone. 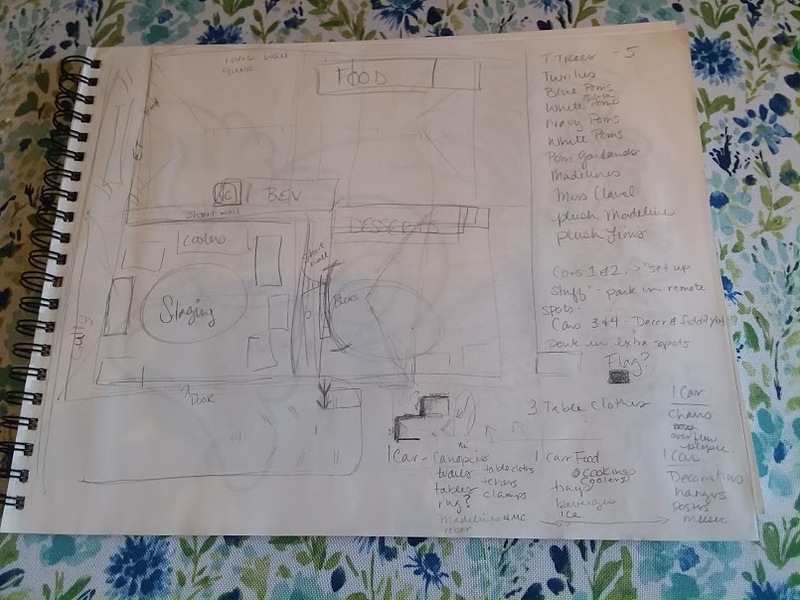 All of the planning was coming into action. 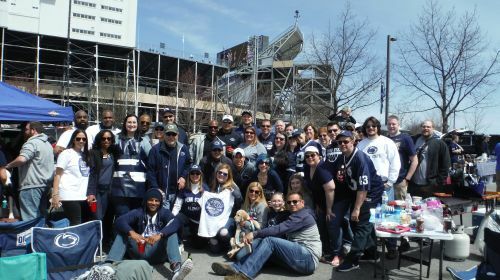 Maddy had been planning for an anniversary tour our our last win in the alumni tailgating competition from 10 years ago. Alaina and I had a Thursday night arrival at Suz's. We stayed up for some late night chatting and drinks until 1. Alaina and I left for the rv lot at 10 am. Due to all the rain, the Overnight RV Lot was being filled up from the back. The lower parts of the lot were soaked from previous rains. We were parked at aisle g and pasture way on the east side of the lot. After getting settled, we walked over to the Meat lab to do my Christmas shopping: everyone gets meat. After stowing the meat, in the RV fridge, We caught the Family clothesline shuttle downtown. While we were waiting for the shuttle a crazy woman pulled her truck across the busy entrance to the lot and she got out of her truck with a young girl. When the lot attendant politely and calmly asked her not to park there, She yelled back at the attendant, “She's only 4 years old. My son works at the university” So odd and unnecessarily angry. Now Downtown, we went shopping. We saw Toby and got my blue zip hoodie that I had waiting for all season. We had a late lunch at the tavern. We caught the shuttle back to rv lot. We attempted to watch the Parade at 6:10, but it must have started early. From our vantage point in front of the IM, we apparently missed a lot of the parade. We hung out in the RV lot until Chad arrived. Team RV walked over to day lot with the wagon shortly after suz arrived. Jess was delayed while driving so we had no utensils to cook breakfast for a bit. In addition to the normal canopy, tables and chairs we also had wooden Madeline figurines, backdrops, a large display book, and a wagon full of books to donate. Many people were hanging decorations on the canopies that were not extended to full height. Eric and I were pounding in stakes for the wooden figures. Suz and others were getting food ready for judging and making a breakfast of cottage bacon and egg casserole for all of us. Setup continued until Maddy got a call from the judges. We all spent a few more minutes of mad scramble to get all of the final details in place. The judges stayed for a long time while Maddy walking them through our tailgate theme and reading to them from the book. Now, it was finally time to relax, get all of the chairs out and eat. A while later, there was a brief hard rain. It was group photo time when the judges came back to tell us we won. I took dog back to rv. Post game, the division between the kitchen was removed and we snacked on wings, onion soup, and cider. Everyone was exhausted. We packed up before 2230. The dirty dish bag was accidentally left behind with the trash and suz had to come back to the lot for it. We picked stuff up at Suzanne's and headed home. My truck's starter died at home While we were cleaning the tanks. 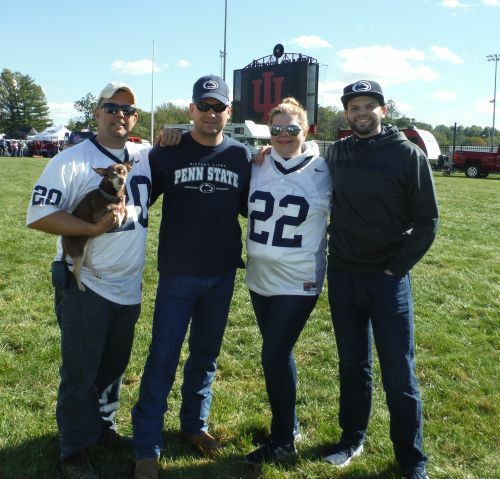 For the RV tailgate of the season, Alaina, Chad and I arrived Friday at Suz’s house to meet Rich and matt. While we were loading RVS with tailgating gear, Chalupa locked truck by stepping on the lock button in the arm rest. I had to pull out the spare key to get back in. Loaded and now unlocked, the RV convoy headed to the overnight rv lot. It was a packed lot and we were parked on west 6th st. There were plenty of seemingly empty spots, but upon closer inspection, the empty spot were due to ruts from Rvs stuck in mud earlier in the day. We got some dead Level spots. But there were plenty of empty spots. We watched a motor home get towed out of the row behind us when he got instantly stuck after turning off the gravel. We set up for game day, then slept. It was a beautiful morning as we set up for the day in the RV lot. We noticed in the daylight that the empty spots nearby actually had tires ruts scattered throughout due to stuck stuck being towed out during the previous day. We continued the book theme this week as we combined our annual Oktoberfest tailgate with J.R.R. Tolkien books for a hobbit's Oktoberfest - the shire meets Bavaria. With all 3 breakfasts.... and wings. It was overcast later, but the shade was a welcome break from the sun. Rich set up the TV in front of his RV. With Chad at deep the frier, we had wings, fries, Onion Rings,Pierogies, Mac and cheese bites/motz sticks. It boiled over at one point, which made for an exciting flair up. Suz made Bratwurst Sliders sandwiches and Rich dished out a St. Louis favorite called Slinger. Most people really enjoyed it. The air was abuzz during the day. We saw F-18 prepare for the gametime flyover. During the day, many skyward banners cruised overhead, including a condom ad and happy birthday amy banner. We also saw a helicopter, which we found out later was a police helicopter that caused havoc in a different lot: USA today article. 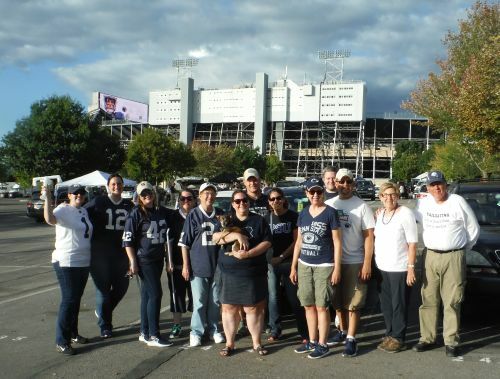 After an entire day of tailgating, it was finally time to go into the game. Damn buckeyes got us by 1 point. Afterward, we enjoyed a few drinks with those who remained and when to bed. For my first home game of the 2018 campaign, my mom and I started Thursday night at Suz’s house with the RV and left Friday AM to get a space in the RV lot. Now on foot, we departed for the Meat lab, the Visitor’s center and Nittany Surplus, where I picked up a new micro fridge for the office. Suz was kind enough to pick us and the fridge up while avoiding getting run over in the parking lot. We all helped with canopy test set up of the new 10x20 and 10x10 canopies from wish.com and then enjoyed some nachos for lunch. Mom and I got a ride downtown for flair shopping and caught the family clothes line shuttle back to the RV lot. We grilled dinner at the RV and made a late night trip to the creamery. They had more creamery milk crates for sale. The new 10x20 blue canopy was set up when Mom and I got over to spot 2533 for our cocktail party tailgate. We played day pigs and enjoyed eggs hollandaise before the noon game. It was a very hot day. I almost got heat stroke during the game because I didn’t drink enough water. I brought dog over after game and we enjoyed the lack of cover after the after game. We wolded up around 9 PM and headed back to RV and house. Thank you Rob & Alaina for hosting our SHITT ON PITT weekend!! 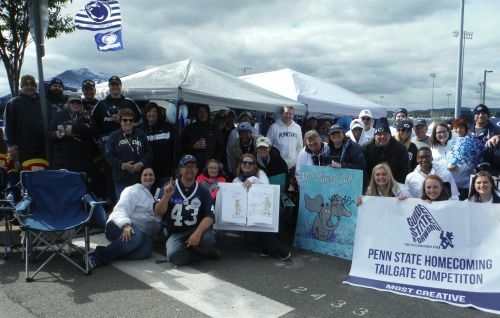 We had plans to tailgate the three rivers again this year, but a few factors made us change our minds. It got moved to a night game. It rained so much that the river flooded. 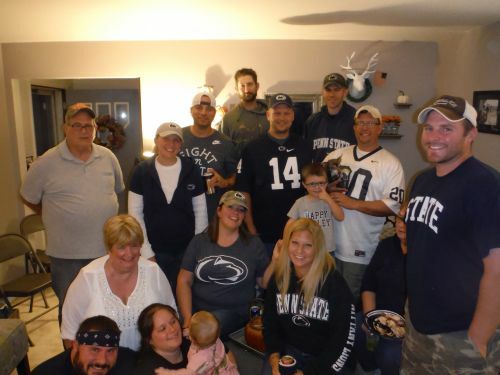 Such a great time with amazing friends watching our Nittany Lions dominate! many cookie cakes do we need, enough pasta to feed an army, is it too early for a beer, shower caps galore, what’s the score, what’s the time, it’s all a blur, cup of beans, don’t hog the heater, keep pace on the swing, parking signs like a pro, stop talking about me! Appalachian State - Unfortunately, I wasn't in State College for this game and no one managed to get a group photo. 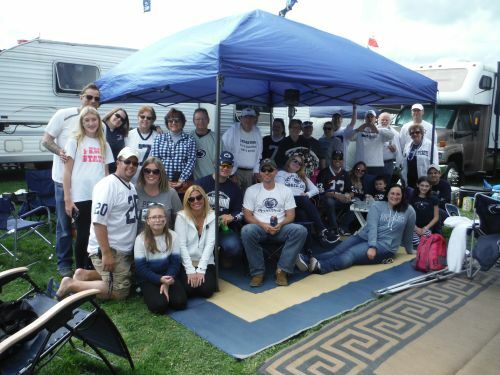 The first tailgate weekend of the season started with more RVs than normal. This was the first year that overnight RV parking for BWW also required a parking pass or cost more than prior years. We had a 4 RV convoy for the first time since 2013 homecoming . We got to State college and met at the old Eat N Park by the North Atherton WalMart at 7:45 PM. It was Rob and Alaina, Larry and Tina, Matt and Kori, Rich and Nell. From there, we caravanned to RV lot. The lot attendants were very friendly and helped us through the new process. Despite my best efforts, I didn't have the correct pass with me and the lot attendants asked me multiple times until I finally gave the correct answer of “Yes, we left the pass at home." We parked all together in a "H" on RV west 6th. Once we got set up, the group made an italian dinner and ate in Rich and Nell’s camper. We had drinks and finished a bottle of Fireball less than an hour. Rich and Matt join the car convoy in the morning. Once setup was complete, they came back to the RV and we all made our way over to the tailgate. The group got parked in spot 1552...in the second row away from the press box. The 10x20 canopy went up with some work. Jeremy and Jason both stopped by. We sang Happy Birthday to Jason. The day started cool, but warmed up quickly and many ended up with sunburns from the cloudless sky. Hard to believe that the week started with 2 days of snow! What a weird winter that it’s been. Chalupa hung out with Cari and Paul most of the day. Shawn and Shari brought their girls and their new puppy, Dakota. Chalupa, as usual, doesn’t like puppies. The young boys were set up with a large variety of monster trucks at the lower end of the tailgate. Rich, Matt and Shawn keep residence on the tailgate. There were many activities going on during the day. A group of us walked over to see Velveeta playing on the stage near the all-sports museum. 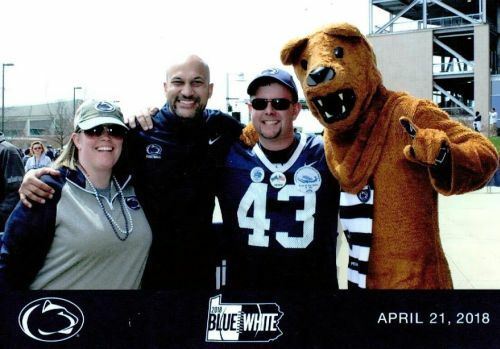 While we were there, we also spotted Keegan Michael Key who was taking photos with the Nittany Lion. Alaina and I waited in line to get our picture. I was trying to think of something cleaver to say to when we finally met. “you done messed up A-A-Ron” was the best that I could think of. He told that, "It was so exciting to be back." The RVers played cards in the RV lot and went to bed. We visited Shawn and Shari's new place, stopped at walmart for some flair and then stopped at Suz’s to see the basement remodel.